Details regarding the 2019 Moot Court Competition are yet to be finalised. In the meantime, here's the information from the 2018 event to give you some background. New Zealand Red Cross will hold the seventh New Zealand International Humanitarian Law (IHL) Moot Court Competition in Wellington on Friday 30 November and Saturday 1 December 2018. The competition is open to teams from each of the six New Zealand law schools. The IHL Moot Court Competition seeks to raise awareness of the laws of war. It also provides an opportunity for law students to make their case and apply the law in a practical setting of a war crimes tribunal. The moot problems are fictional, but deal with real issues. Download the moot problem below. The IHL Moot is open to teams from all the law schools in New Zealand. New Zealand Red Cross does not select participants; teams are selected through the mooting society active in each Law School and/or at the discretion of the Dean of the Law School or academic faculty who is working with student mooters. There may be internal competitions or other methods of selection at each school before teams register. After registration, New Zealand Red Cross sets up travel and accommodation arrangements for participants to arrive early Friday morning and depart Sunday morning. To achieve the most economic cost to New Zealand Red Cross, this usually involves travelling very early Friday morning and accommodation for two nights. Further arrangements can be negotiated at the participant’s expense for any difference in cost. a session in the afternoon to introduce Moot participants to IHL and the work of New Zealand Red Cross and the International Committee of the Red Cross. On Saturday morning the Moot preliminaries get underway, judged by IHL experts from wide-ranging professional backgrounds. At lunchtime, the finalists are announced. 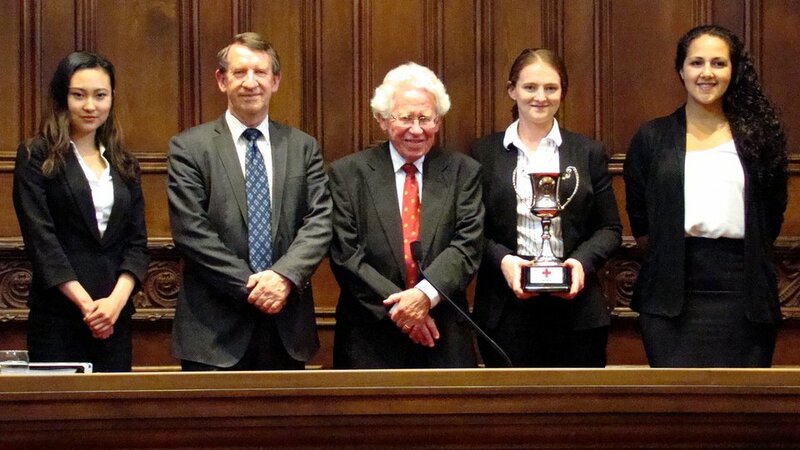 The final is held on Saturday afternoon in the Old High Court and judged by a panel of distinguished senior judges. Following the final and the awarding of the trophy, all the participants attend a reception on the Saturday evening hosted by His Excellency Dr David Vogelsanger, the Ambassador to New Zealand from Switzerland. There, a further award is made to the best speaker in the competition. The reception is the formal end of proceedings.